You Have Nature Questions? We Have Nature Solutions. You have nature problems? We have natural solutions. 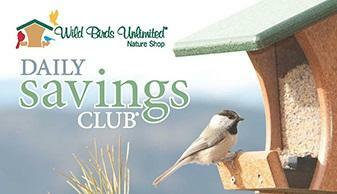 Daily Savings Club® members already know about the Best Bird Food in Town. But did you know that Wild Birds Unlimited is the place to go when you have questions about nature? Whether it's deterring squirrels or offering a new food to attract a migrant bird, we have answers that will make your backyard more enjoyable.